If you are diabetic, there are many treatment options available, and supplements to try. However, help for diabetes may be closer than you think. These 6 essential minerals can fight the symptoms of both type 1 and type 2 diabetes. Minerals are an essential part of the human body. Minerals are just as vital as vitamins in keeping your body healthy and happy. In fact, mineral deficiencies can lead to a host of health problems, including an increased chance of diabetes. If you have diabetes, ensuring your diet is rich in the following minerals will help you restore balance to your body and reduce the need for diabetes medications. Combined with other natural treatments for diabetes, you may find that you no longer suffer from diabetes side effects at all. Before taking any of these supplements, consult with a health professional to identify their potential risks and benefits in your particular case. Chromium is a well-documented mineral that can help prevent and help with controlling blood sugar levels in existing diabetes. Chromium is also essential for the population of insulin receptors, for binding insulin to cells, and for increasing the utilization of glucose. While high doses of the mineral can be toxic, small dosage amounts have been shown to help diabetics with type 2 diabetes. Some studies have indicated that chromium picolinate may be more effective than other forms of chromium in supplements, as it is easier for the body to absorb and use. According to studies, chromium can enhance the effects of insulin. Deficiencies in chromium impair blood glucose control. In several studies, it was shown that those with diabetes have abnormally low chromium levels. The trace mineral may be able to reduce insulin levels and improve the lipid profile in diabetics. A 1997 study published in Diabetics Journal, looked at the difference between dosing with 200 mg of chromium twice daily or 100 mg of chromium twice daily. According to the study, the higher dose of chromium showed a faster reduction in blood glucose levels than the lower does. However, this does exceed the Estimated Safe and Adequate Daily Dietary Intake levels for chromium, which could result in unwanted side effects. According to the Joslin Diabetes Center, dosages up to 200 mg daily should be safe for most individuals with diabetes. According to Web MD, there are a few side effects of taking too much chromium. Common side effects include chronically-low blood sugar, stomach pain, liver and kidney damage, and irregular heart rhythms. Side effects from supplements are rare, however, because the body normally eliminates excess chromium through urine. Many antacids (including calcium carbonate), interfere with the absorption of chromium, so it may be necessary to take higher doses when also taking calcium supplements. 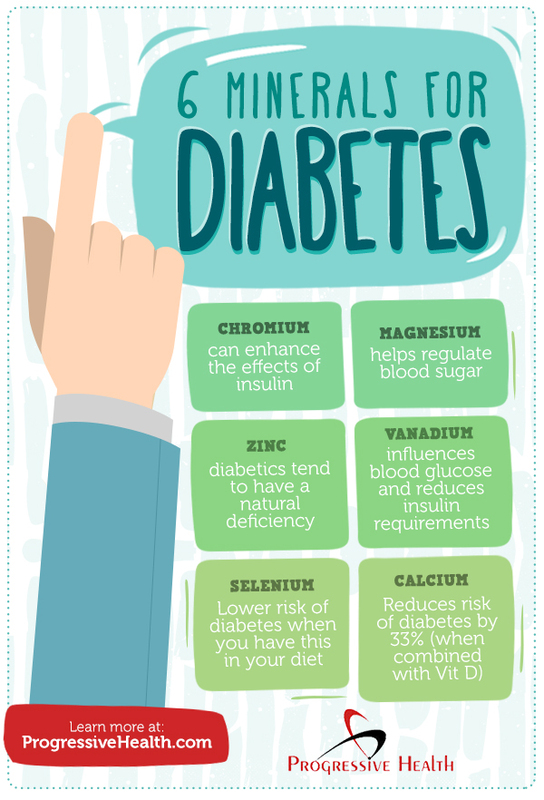 Since chromium can boost insulin receptors and lower blood glucose levels, it can be helpful in reducing diabetes symptoms. A 2002 review of several chromium studies related to diabetes showed somewhat inconclusive results. One study from China showed that chromium supplements significantly reduced blood glucose levels in diabetics, but other studies showed no change or minor changes. Despite inconclusive results, many diabetes doctors recommend that their patients take chromium supplements. In individuals without diabetes, however, chromium supplements did not benefit blood glucose levels, according to the 2002 review. Magnesium is an essential mineral that is necessary for many of the body’s functions: from mood-regulating to hormone health, to fighting insomnia, and even preventing and helping diabetes. Many adults are magnesium deficient, thanks to the reduction in minerals in the average American diet. Magnesium plays a huge role in the body, according to the National Institute of Health. It develops bones, helps regulate blood sugar, improves mood, controls the nervous system, keeps the heart regulated, and can help lessen PMS symptoms. The biggest role of magnesium for diabetes is its role in controlling blood glucose levels. The National Institute of Health recommends that healthy adults consume about 400 mg of magnesium daily, from both food sources and supplement form. Magnesium is present in many foods, including leafy vegetables, fiber, and water. Current food processing reduces the magnesium content in many foods, which is one reason why so many Americans are deficient in the mineral. There are surprisingly few side effects to magnesium supplements. This is attributed to the fact that the body eliminates magnesium through urine. If the body has too much magnesium, it simply eliminates it that way. However, high supplement dosages could result in minor side effects including mild stomach pain and nausea. Magnesium can interfere with a few medications, including bisphosphonates and antibiotics. Diuretics and Proton pump inhibitors can lead to a magnesium deficiency. A 1996 study conducted by Overlook Hospital in New Jersey examined the link between diabetes and magnesium deficiency. The researchers found that 25 percent or more of diabetic patients, either with type 1 or type 2 diabetes, were deficient in magnesium. Lowered magnesium levels have also been linked to insulin resistance in elderly diabetic patients. Supplementing with magnesium could improve insulin receptors and help regulate blood sugar levels. A review of over 7 studies of magnesium and type 2 diabetes investigating nearly 300,000 patients over 17 years, showed that supplementing with 100 mg of magnesium a day was able to reduce the risk of diabetes by around 15 percent. Another review showed that the risk reduction was about 23 percent. Zinc is an important mineral that provides many benefits for the body. According to the National Institute of Health, the main function of zinc is for energy, cell production, protein synthesis, and development. It is necessary to have a steady dietary or supplement intake of zinc because the body cannot store zinc for future use. A deficiency in zinc can lead to many problems. A lack of zinc can lead to issues like growth retardation, impaired immune function, impotence, hair loss, delayed wound healing, mental lethargy, and more. The role of zinc in diabetes has not been directly identified, but several studies have shown that diabetics tend to have a natural deficiency in the mineral. Dosage Amount The National Institute of Health recommends that healthy adults take about 40 mg of zinc daily for optimal nutrition and health. These sources can come from supplements or food. High zinc levels can lead to unwanted side effects. Taking more than the recommended daily amount can lead to side effects like nausea, vomiting, headaches, and loss of appetite. Too much zinc may reduce the body’s absorption of copper. Too much iron can interfere with the body’s absorption of zinc. Zinc supplements can interfere with some medications, specifically the absorption of Penicillamine, which is used to treat arthritis. Several studies have shown that diabetics can have low zinc levels. A 2009 study from Harvard Health looked at how zinc levels influence diabetes risk for women. The study looked at around 80,000 women over a period of 20 years. The researchers found that higher zinc levels were associated with a slightly reduced risk of type 2 diabetes. Calcium is the most abundant mineral in the body and is beneficial for many processes in the body- from bone health to nerve transmission. It is also a mineral that could help reduce diabetes risk by up to 33 percent. Calcium does more than just build bones. Calcium is also necessary for keeping teeth healthy, for transmitting nerve signals, for hormone secretion, for muscle function, and more. Calcium is part of many of the body’s metabolic systems and functions, but the exact role of calcium for diabetes is unknown. The National Institute of Health recommends that healthy adults consume between 2,000 mg and 2,500 mg of calcium per day from food and supplement sources. It is possible to have too much calcium in your body. Excessive levels of calcium can lead to issues including difficulty absorbing iron and zinc, constipation, tissue calcification, kidney stones, and primary hyperparathyroidism. Calcium supplements can interfere with bisphosphonates, fluoroquinolone and tetracycline antibiotics, levothyroxine, phenytoin, and tiludronate disodium. Studies on diabetes and calcium have been somewhat confusing. Some studies have indicated that high doses of calcium may actually lead to a higher chance of getting type 2 diabetes. However, other studies have shown that calcium supplements can be beneficial in reducing diabetes risk. One study conducted by Tufts-New England Medical Center in 2006 looked at the effects of supplementing with vitamin D and calcium for diabetes. The study looked at over 80,000 women over a course of 20 years. The researchers found that after adjusting for other factors, a daily intake of around 1,200 mg of calcium and 800 IU of vitamin D was able to reduce a woman’s risk of getting type 2 diabetes by about 33 percent. Researchers concluded that supplementing with both vitamin D and calcium at the same time was beneficial for protecting against diabetes. Vanadium is a strange metal that is surprisingly beneficial against diabetes in many studies in animals and humans. The use of vanadium as a dietary supplement is highly controversial, as vanadium can be toxic in high doses. Vanadium is actually an essential mineral in the body that helps regulate growth. A deficiency in vanadium was shown to retard the growth in rats and mice. Vanadium is present naturally in trace amounts in many foods and in water. The trace mineral hasn’t been extensively studied, but the benefit for diabetes is suggested by the trial results from the few studies conducted on vanadium. Since vanadium is a trace mineral, there are no dietary recommendations for supplement intake. The two most common forms of vanadium in supplement form are vanadyl sulfate and sodium metavanadate. In a study where vanadium was able to help reduce the need for insulin in type 1 diabetics, study participants took 125 mg of vanadium daily. Vanadium can be extremely toxic in large doses. Common side effects of the 125 mg dosage included stomach ache, nausea, and diarrhea. Higher doses can lead to further complications, including high blood pressure, vomiting, and decreased red blood cell count. A 1999 study conducted by Henry C. Lukaski, Ph.D. stated that at the high doses of vanadium required to benefit blood glucose levels, all benefits from supplementing with vanadium are pharmacologic. A 2003 review of 108 studies on various herbs and supplements for diabetes examined the role of vanadium in diabetes. The researchers found that vanadium supplements can influence regulated blood glucose levels, modulates hepatic glucose output, and enables type 1 diabetic patients to be able to reduce insulin requirements after 2 weeks of supplementing with vanadium. Selenium is a vital mineral that is essential for bodily health. Selenium is present in many foods and is also available in supplement form. Selenium plays a vital role in many functions of the body, including thyroid health, DNA synthesis, protection from infection, and reproduction. It also has a protective effect against diabetes, although researchers have not identified the precise link between selenium levels and diabetes. The National Institute of Health recommends a daily selenium dietary and supplement intake of 55 mcg. There are no known side effects from taking selenium, but some medications can reduce the level of selenium in the body- notable, the chemotherapy drug Cisplatin. A 2012 study from Yeungnam University in Korea looked at the levels of selenium in the toenails of around 6,000 men and women to assess any correlation between diabetes risk and selenium intake. The researchers found that in dietary levels of selenium intake, men and women had a reduced risk for type 2 diabetes. Individuals who took selenium supplements showed a higher reduction in risk for getting type 2 diabetes. Minerals are extremely beneficial. If your mineral intake is even slightly off, it can lead to a wide range of problems and make diabetes symptoms worse. Even if you do not currently suffer from diabetes, ensuring the proper intake of these minerals can help you lower your chances of getting type 2 diabetes by up to 40 percent. When looking for ways to benefit your health, minerals should not be neglected; particularly if you are suffering from diabetic symptoms of type 1 or type 2.